It’s starting to warm up and there’s no better way to enjoy the beautiful weather than entertaining outdoors. Whether you’re having a picnic at the beach or at the park or in your own backyard, enjoy something satisfying and healthy. Anna Zoitas, creator of Three Olives Olive Oil, shares her recipe for a delicious salad that will have everyone talking about. Try this beautiful green-hued rice salad with soy-glazed salmon or tofu, teriyaki chicken or steak. “The seasoned rice vinegar, pickled ginger, and texture of our Bamboo Rice make me think of sushi rice when I eat this,” Zoitas says. 1. In a saucepan, heat bamboo rice, water and 1 teaspoon salt to boiling. Cover and simmer 20 minutes. Let stand 5 minutes. 2. Gently spread rice on large rimmed baking sheet. Sprinkle with seasoned rice vinegar and olive oil; toss gently to coat. Cool to room temperature. 3. 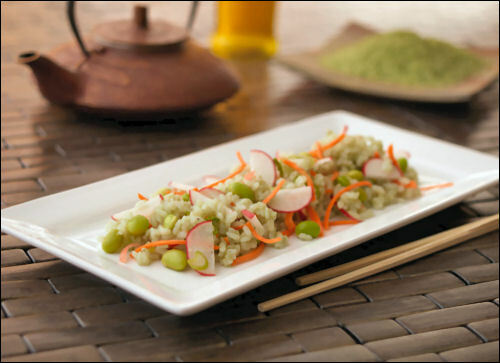 In a large bowl, gently toss rice with edamame, carrot, radishes, pickled ginger, scallions and salt & pepper, to taste. Visit The Artisanal Kitchen for more information on Three Olives Extra Virgin Olive Oils.